A photograph was taken by Douglas Studios of Houston, Texas, on January 24, 1950, of a halo-like light above the head of William Branham. Gordon Lindsay took the negative to George J. Lacy, an Examiner of Questioned Documents, who was asked to determine whether or not the light could have been the result of improper exposure, double exposure, or tampering during the developing process or retouching. A written report was prepared stating that the unusual brightness was caused by light striking the negative. Message believers are under the impression that this photograph was verified by the FBI, hangs in the Hall of Religious Art in Washington, D.C. and captures a light of supernatural origin. Do these claims hold up to scrutiny, and is this vindication legitimate? 6 The Hall of Religious Art in Washington, D.C.
Click here to read a copy of the January 24th, 1950 issue of The Houston Press. It was during the Houston campaign in 1950, that Rev. 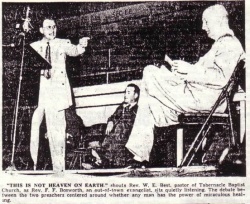 W. E. Best (representing the Houston Baptist Pastor's Conference) accused William Branham of racketeering and leading people astray. A public challenge was issued, and F.F. Bosworth accepted a challenge on the subject of "Divine Healing Through the Atonement." While Bro. Branham cautioned Brother Bosworth against being argumentative, the newspapers reported that the two ministers talked at once, and a fist-fight broke out in the audience. The meeting was given front-page publicity in the Houston newspapers. As the debate got under way, it was quite apparent that the sympathy of the vast audience was almost entirely on the side of the visiting evangelists. Large numbers of members from the same denomination as Rev. Best stood to their feet as witnesses that they believed in Divine healing and had in fact been healed. We are told that Rev. Best secured the services of Mr. James Ayers and Mr. Ted Kipperman, professional photographers from Douglas Studios in Houston, to document the evening. They were there in addition to the newpaper photographers. After taking several photos of Rev. Best, the photographer snapped a picture of William Branham, who spoke briefly just before the service closed. God did allow developing of the picture of Rev. Best pointing his finger at F.F. Bosworth. In fact, it was published in the newspaper as shown above on the right. There is no record of George Lacy ever referring to the photograph as supernatural. The FBI were never involved in the examination of the photograph. The picture never hung in the Hall of Religious Art in Washington, D.C. In fact, the Hall of Religious Art appears to be a figment of William Branham's imagination. George J. Lacy's report did not comment on whether the source of the light was natural (i.e. electric indoor lighting) or supernatural. 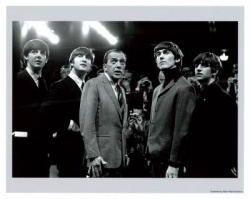 While newspaper articles about the Coliseum around that time show that there were flood lights in the building (including photographs of a concert by the Beatles), George J. Lacy's report does not indicate anything about the source of the light. Some observers note that if the pillar of fire was directly over William Branham's shoulder, it would have cast light on top of his head and the pulpit. 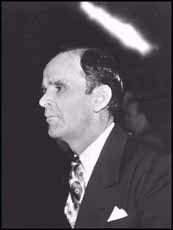 Instead, the top of his head is not lit and the light appears to be from a source beyond William Branham. The most likely explanation for this is that the light is actually one of the indoor floodlight banks that was used in the Sam Houston Coliseum. These observers state that if the light was not from indoor lighting, it may have been the result of the flash from the camera reflecting off a metal pole or beam in the background. The picture immediately above on the right was taken in the Sam Houston Coliseum in 1969. At right is Willie Somerset (#12) of ABA's Houston Mavericks basketball team. 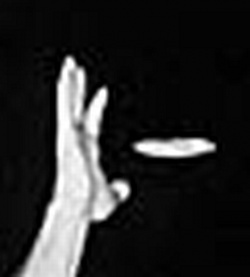 Note the "pillar of fire" type light by the player's hand. If we zoom into the light by the players hand (see photo on left), we see something that is not that dissimilar to that of the picture of the "pillar of fire" that was photographed over William Branham's head. And this also lines up with the argument that the light passed through the lens of the camera and showed up on the negative. Because of the principle of "depth of field", a picture taken with a telephoto lens would tend to cause anything in the background to be out of focus. And given the poor dynamic range of film in the 1950's, a bright light source such as a rack of flood lights, would look "blown out" or overexposed in the photograph, just as the "pillar of fire" appears to be completely white. if the light was, in fact, a bank of floodlights then light did pass through the lens and did strike the negative. Was the actual reason that no one noticed the "pillar of fire" was that they all saw it for what it really was - one of the flood lights in the Sam Houston Coliseum? 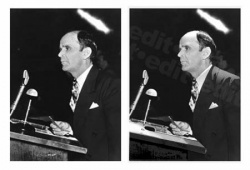 If the "pillar of fire" was an actual light source above William Branham's head that showed up on the negative, why doesn't the photo look more like the edited version the right? It must also be appreciated that the picture of the basketball players is from 1969, almost 20 years after the photograph of William Branham was taken. It is likely that the lighting for a church gathering would have been set up completely different from that of a basketball game and also likely that the light fixtures would have been completely different 20 years earlier. And George J. Lacy, the best there is in United States, on research was brought from California to Houston, Texas, for to take the negative under consideration. He kept it for days. He looked through the lights; he looked at the camera. He took everything, and 'fore he could sign, because he's a FBI agent today, the best they got. And now, this great Pillar of Fire that's absolutely identified even by scientific cameras, that's here on the earth today. There's the picture of It hanging there. I believe it's still there, isn't that right? Is it there? Scientifically proven by the best we got. George J. 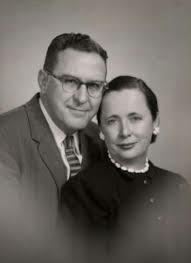 Lacy, the head of the FBI for fingerprint and documents, said, "I called it psychology myself, Reverend Branham, but," said, "the light struck the lens. I put it under ultra-ray lights and had an examination here for four or five days. And the light struck the lens. And this lens won't take psychology." Now, that's identified. Mr. Lacy was not an employee of the FBI. He was NEVER the head of the FBI for fingerprint and documents. The FBI had no involvement with the examination of the Houston photograph. Mr. Lacy lived and practiced in Houston and was not brought from California to Houston to examine the photograph. William Branham appears to have invented all of these various stories in an attempt to hype the Houston photograph. After conferring with William Branham, Gordon Lindsay arranged for the negative to be turned over to George Lacy to examine the negative. 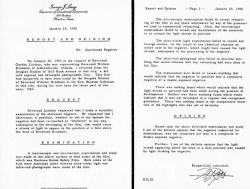 After his examination, Mr. Lacy gave a certified statement indicating that it was his opinion that the negative was genuine, and had not been "doctored" or retouched or the result of a double exposure. The Hall of Religious Art in Washington, D.C.
And one of them is in Washington, DC, in the religious Hall of Art, with a note under it, "The only supernatural being was ever photographed in the history of the world." And now, then, if you're ever through there, drop in, see it. The problem with William Branham's statement is that there is no Hall of Religious Art in Washington, D.C. There is a copy of the picture that someone sent to the U.S. Library of Congress for preservation. But the photo does not hang on the wall and there is no caption underneath it. Rather, it sits in a filing cabinet. We have personally been to the Library of Congress and have seen the photo in the file folder. It was never hanging on the wall but remains in a filing cabinet. And where are the "halls of Germany". Something else that William Branham invented? However, there are a number of fake photographs that have been photoshopped to indicate that they were taken in the "Hall of Religious Art" but they are simply the invention of message believers that would rather create a lie than admit they are wrong. You can see an example of one of the fake pictures here. And it was given into the hands of George J. Lacy... He kept the picture for two days; then he sent word, said, "We'll give the reading on it, and let you know about it on two o'clock, on the following afternoon, on the third day. Big bunch of photographers, and so forth, gathered in. Many of the people around the city, like the writer for the "Colliers" and "Times," they gathered in. And when he come out, he's kind of a red headed fellow, very hard-boiled. He walked out sarcastic; I looked at him, and looked like his face had tendered up. He said, "Whose name's Reverend Branham?" And I said, "Mine, sir." He said, "Stand up on your feet." And I stood up. He said, "Reverend Branham, one of these days, you're going to pass off of life's scenes like all mortals do." I said, "I'm aware of that, sir." He said, "But as long as there's a Christian civilization, your picture shall never die." He said, "It's the first time in all the world's history that a supernatural Being was ever photographed. But I put it through every test that can be thought, and," said, "It was a supernatural Being that's been shot." He said, "For myself, I have said and heard of your meetings, and read it in the magazines, and I heard about that Angel, and so forth. I said within myself, even to the time that I received the negative, 'It's psychology.'" 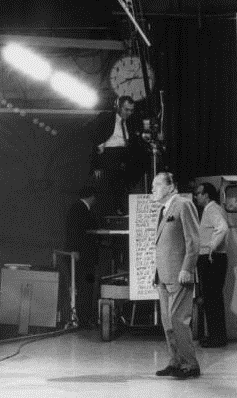 He said, "But Brother Branham, the mechanical eye of that camera will not take psychology." Said, "The Light struck the negative." If George Lacy spent all of this time looking at the picture, shouldn't he have recognized the man in the picture, William Branham? Why doesn't the actual written report below include William Branham's statement that it was a "supernatural being"? This page was last edited on 17 December 2018, at 16:19.